Villa Gao is a two-storey vacation residence that features boxy yet open architecture and minimalist design. Elegantly crafted accouterments and hotel quality accommodations are deliberately placed in cool and glassy spaces – to guarantee your pure indulgence and pleasure. 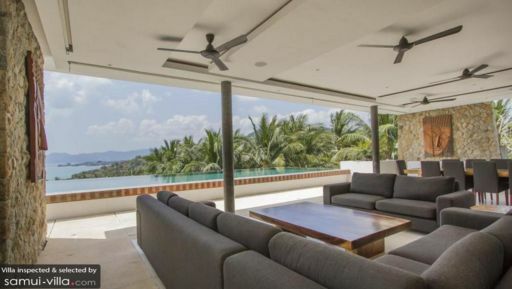 Nestled amidst the lush hills of the Samujana Estate, Villa Gao creates for you fancy vacation living with, literally and figuratively, an atmosphere that’s definitely high end. One of the villa’s four bedrooms is on the second floor beside the pool area and the common space. The rest of the bedrooms are on the ground floor. All bedrooms extend to their own bathrooms with rain showers, oversized bathtubs as well as private gardens. The bathroom of the second-floor bedroom, however, has a jacuzzi and an outdoor shower. Along the rim of the second-floor exterior is the 16-meter, saltwater infinity pool with a magnificent view of the bay. Shaded pool beds for lounging are on the stone deck at one end of the pool. Here, you can also have sunset cocktails followed by a barbecue party especially on cool evenings. Indoors, facing the pool area, is the villa’s sunny common space composed of the living area, the modern kitchen behind the couch and the dining area just across. Beside the kitchen is one of two cinema rooms – the other is on the ground floor which extends from the game room. This ground floor common space has billiards and ping pong tables, a bar, a TV lounge and a creatively built-in play area for the kids. The villa’s attentive staff, headed by a manager, will endeavor to make your stay truly blissful. Other than extending everyday services like airport transfers, daily breakfast, housekeeping, garden and pool maintenance as well as security, the staff can engage more personnel for tours, babysitting, personal catering, laundry and wellness which will be charged to your account. Your vacation wouldn’t be complete without a day at Choeng Mon Beach where you can swim, snorkel or get active with exciting aqua sports. Nearby Koh Fan Noi is accessible on foot at low tide. The Walking Street’s Night Market comes alive every Wednesday where you can take advantage of affordably priced presents and souvenirs.